ALL of my silk and wool fa brics are new, off the bolt. Most of the silk fabrics I sell (mostly silk dupioni) are cross-dyed or iridescent, which means that the silk was woven with weft (horizontal) and warp (vertical) threads of different colors. These cross-thread combinations produce gorgeous colors that often appear to be quite different from the colors of the cross threads. The overall impression or whole becomes different from the sum of its parts. 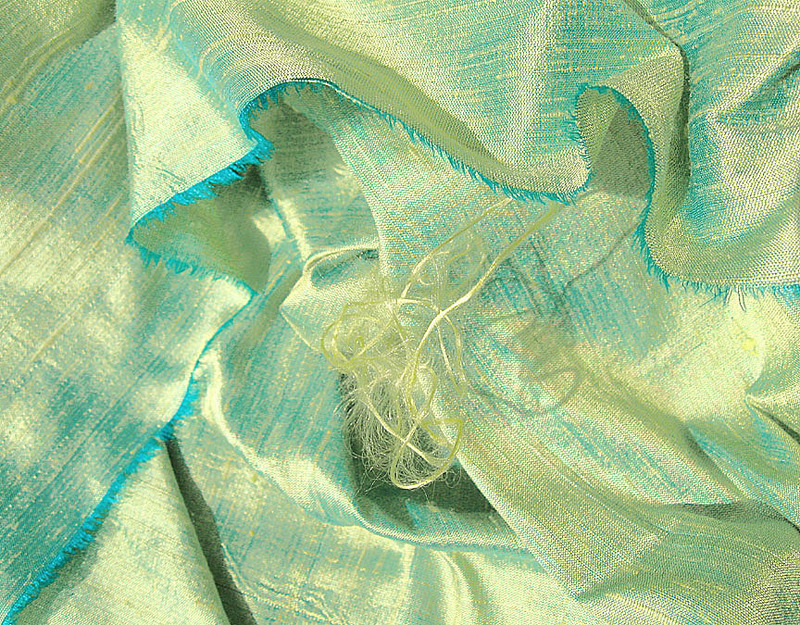 The silk on the left was woven from cross threads of bright lemon yellow and aqua. Yet when you stand back from the silk, you can get an impression of lemon lime green with a brilliant sheen. I photograph my fabrics in natural light. Before I list a silk for the first time, I typically take at least 100 shots of it and I often shoot a silk hundreds of times. The color and angle of natural light constantly change. Light and shadow distort color, color intensity and overall impression. Sunny light makes colors appear warmer and sunless light (ie, overcast or cloudy daylight) makes colors appear cooler. Direct and indirect light (both sunny and sunless) also affect color. Artificial light (eg, camera flash, incandescent, fluorescent light) can create distortions. A smaller piece of fabric can look different from a larger piece. The larger piece catches light and drapes differently and this changes color, color intensity and overall impression. Color description is subjective and you and I may have different interpretations of terms like “burgundy,” “coppery,” “lilac,” or “golden.” If you have a need to match color more precisely, please ask for a swatch. It is virtually impossible to match color accurately online since the calibration of my screen can be different from yours. Not all types of silk look and feel the same, and each has its own distinct personality. Silk dupioni usually but not always has a textured surface with slubs and this is hand loomed. Machine loomed silk has a smoother surface with minimal slubbing and I mention that in my descriptions of machine loomed silk. Silk typically has irregularities and these aren’t defects. Please read my Shop Policies and before you purchase, feel free to ask any questions. Affordably priced silk isn't easy to find, and this is certainly true of silk remnants in sizes suitable for dolls, miniatures, quilting and other types of projects that don't require yardage or larger sized pieces. I understand that projects can have specific needs, so I try to be flexible about custom sizes and can often accommodate customers' requests. If you need a differently sized piece, please feel free to me at nchad816@comcast.net. Most of my wool fabric is from Woolrich, which is milled in the USA. I tend to hand dye wool fabrics in colors you'll probably never see in stores – like lime, dusky lavender, melon, aqua, candy pink and cornflowe r blue. I only use professional dyes and I don't immerse the wool in hot or boiling water. It comes out of the dryer lightly felted, fluffy and soft and ready to be appliqued and embellished. Hand dyeing wool fabric is hard work physically, but I enjoy the challenge of creating colors that are unique and hard to find. I offer new silk and wool threads, yarn and floss – both undyed and hand dyed – in different weights and thicknesses that can be used for embroidery, braid, trim, applique, quilting and surface embellishment. Is it "yarn" or "thread"? The terms "yarn" and "thread" can be confusing or misleading because they generally aren't relevant to how the silk or wool looks or its thickness. The thickness of a silk "yarn" can actually be much less than that of a human hair. The thickness of one of my silk yarns is less than 1 millimeter, which is only 0.039 of one inch! If you want to buy undyed or hand dyed silk or wool in large quantities, such as 200 or 500 yards and more, you can probably find online sources without much difficulty. But suppose you need only 50, 25 or even 10 yards? I know that these are virtually impossible to find, so I offer undyed and hand dyed silk and wool threads and yarns in smaller amounts suitable for single projects. All of the silk and wool threads and yarns I sell are free of knots, so you won't have to do any work-arounds or lose any yardage. You can custom color the undyed threads and yarns with paint or dye or you can just use them as is.